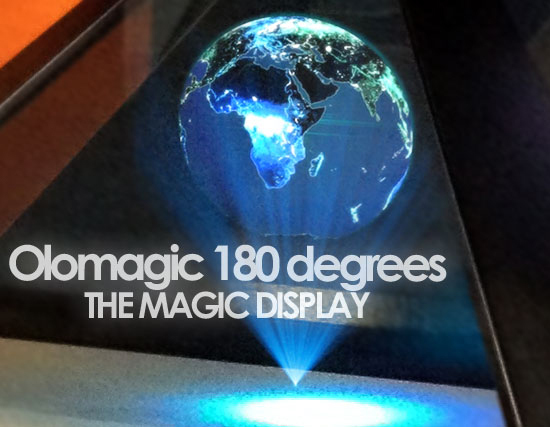 olomagic | The magic display that generate 3d images in space. As opposed to banners or hoardings that are usually flat two dimensional display, holography is three dimensional. You can move your head and look around the product. Projection techniques are employed to create an illusion of a three dimensional product suspended in the air. The effect is mesmerizing and creates a far greater impact that simple two dimensional prints can never achieve. As such holographic projection is a sure attention getter and the perfect marketing tool. It brings a product to life through full color three dimensional display. Whether it is exhibitions, product launches or trade shows, holographic projection adds a new dimension and creates a visual buzz like no other. Instead of looking at photographic reproductions visitors can now actually feel as if they are viewing the actual product itself. If haptic or touch technology is incorporated, the experience can simulate touch and feel. However, even without this, the effect of holographically projected image is simply stunning and realistic. Where other stalls are decked out with 2D graphics, you can have a holographic projector creating a marvelous image of a product that can be viewed from different angles. You can well imagine how people will be drawn to look and examine the simulated image. This type of projection does not require viewers to put on any special glasses and they can view a product in full color from a 180 degrees perspective or even have a 360 degree view. For most practical purposes such as use in trade shows, product promotions and exhibitions, a 180 degree holographic projector is more than sufficient since the equipment can project three dimensional images. In its infancy holography relied on the use of film images created by interference patterns of laser light and hence could project only monochrome images. Current digital technology for holographic projection is far advanced in that it can combine the actual product as well as a holographic image suspended in the air in full color and in full HD. Creating the film required special equipments and set up. Today’s digital technology is simple and inexpensive and a user can load any number of such images on a USB drive. The holographic projector can adjust illumination too. Yet another projection technique combines holography with a 19inch LCD display, mapping video to the hologram to create highly striking visuals. 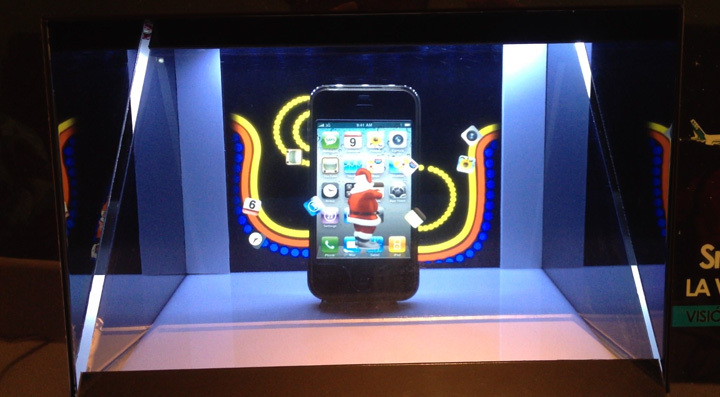 The holographic image appears suspended in space, whereas a display at the base shows a video, leading to a richer viewing experience. This method opens up interesting ways to promote products and show them in a different perspective. If you wish to create impact and attract visitors in an exhibition space crowded with posters and banners jostling for space and for attention, switch to affordable and compact 180 degree holography projectors. These will prove an instant hit and add to the brand image. Holography is the technology of the future and, by association, your company will be perceived as being far ahead of its competitors. When you are associated with a trade, you have to go through a large number of meetings nearly every day. Business meetings, clients meetings, trade meetings and product displays in front of the investors for the coming year are just a couple of them. It is simple to sit back and yawn in a boring meeting when it is not yours, but when it is yours you have to take serious steps to make it as interesting as possible. People do not like watching those boring projection slides when it comes to business. You have to be creative while thinking out of the box to generate attention among your buyers like using a holographic image projection. 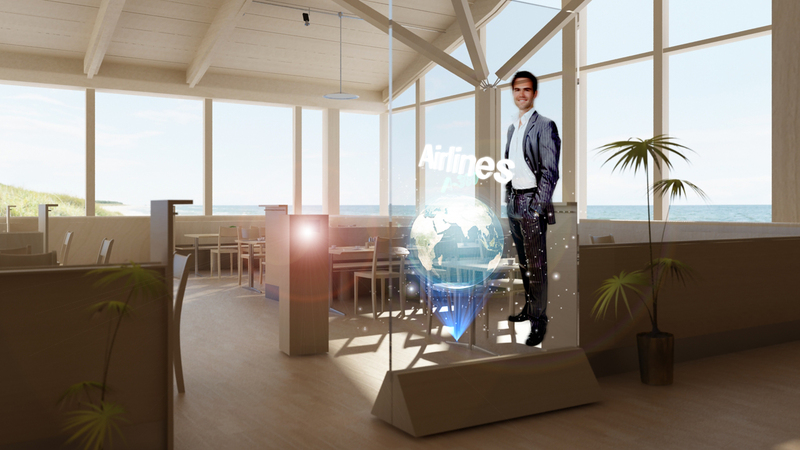 It is a smart technology using holograms in advertisement to create the eye catchy effect you have been looking for in your advertisement plans. They are perfect for any client meeting where you need something different to get attention of the buyer. Instead of those old school projectors and PowerPoint slides, use three dimensional holograms. You can place them in front of the buyers top provide them 180 degree view for sufficient perspective of the product. Alternatively, you can merge the real product with three dimensional texts and images for that creative appearance. Your clients will love the creative and futuristic approach provided to the product display with the holographic image projection. 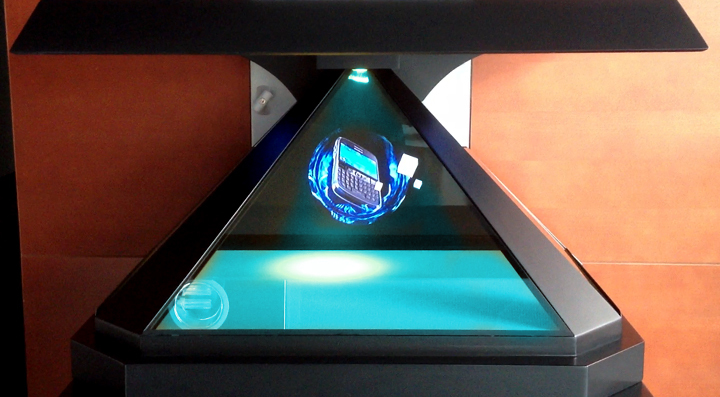 Contact Olomagic if you want to impress your buyers and clients with the smart holographic displays. Over here, you can choose among some of the best holographic displays manufactured keeping the marketing in mind. Olomagic is an impressive and innovative product. Olomagic is a holographic display that generates three-dimensional images in space. The display can be customized according to the needs of the company, at the same time we can interact three-dimensional images with real physical objects. Olomagic introduces a new dimension, a new way of marketing and communication, transmitting an impressive message to the consumer or spectator. 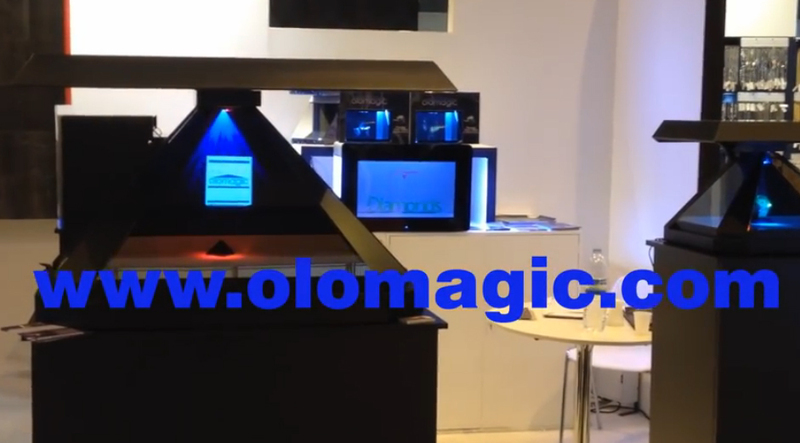 The Olomagic offers a variety of posibilities and can be used in retail establishments, conferences, shopping centres, museums, airports, events etc. The Olomagic display is available for sale or rent. Our team will advise you, personalizing and adapting the product to your needs. Not only creating the holographic images but there is also the possibility to incorporate logos and corporative colors.